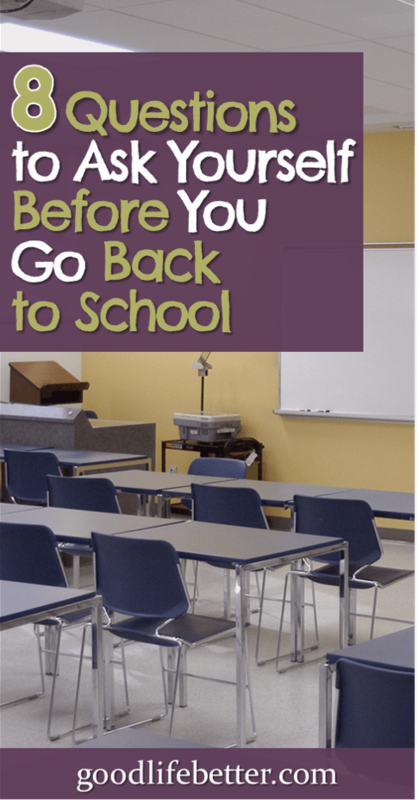 8 Questions to Ask Yourself Before Going Back to School | Good Life. Better. One of my favorite movies is Legally Blonde, a 2001 comedy starring Reese Witherspoon as Elle Woods. Elle is a ditzy sorority girl who goes to Harvard Law School to try to get her boyfriend back, only to realize she deserves way better (and that she has some serious legal chops!). When I look back on my decision to go to law school, I am reminded of this exchange. I obviously invested a lot of time applying to law school (the complicated application process ensured that was the case). I had to practice for and take the LSAT, and get letters of recommendation and apply for financial aid. I also had to write my admissions essay (which, unlike in Elle’s case, was not a video directed by a Coppola). But actual time spent on deciding law school was a good life/career/financial decision? That having my J.D. would make me more competitive for jobs I might some day want (but not identifying specific jobs). That I wouldn’t have to borrow too much (but not “or I could not go and not borrow anything”). That it would only take four years (but not whether I might one day regret losing the prime years of my thirties to a dark vortex of work/school school/work given there would only be a few weeks out of each year when I wasn’t both a student and an employee). 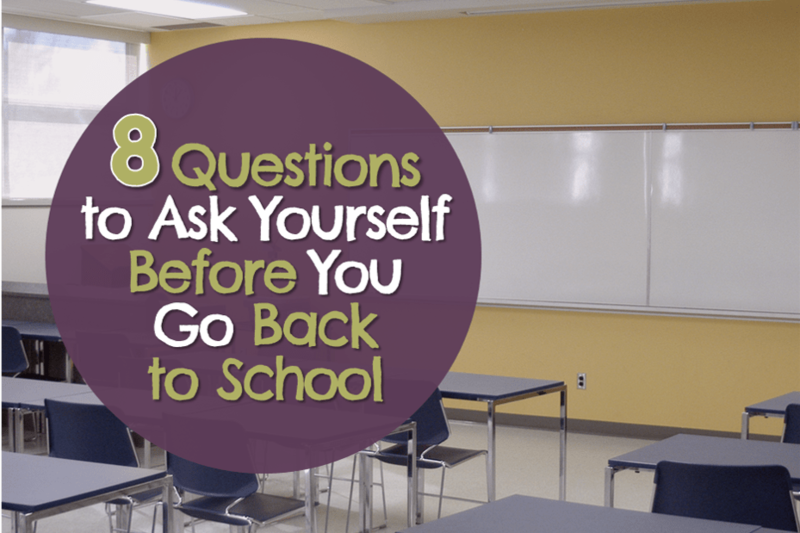 If you are thinking about going back to school, ask yourself these eight questions to determine if it is the best move for you. 1. Why do you want to go back to school? I know this is a super obvious question but maybe because it is so obvious, it is easy to overlook. Do you need or just want a degree? If you genuinely need to acquire additional skills, is a degree the best path to do this? Would on-the-job training or a certificate program suffice? In my case, I know I was way more excited about being a law student than I ever was about being a lawyer. And while I am in a profession where a law degree is valuable, it isn’t necessary. The cohort of people I started with were able to advance in their careers just fine without adding a J.D. behind their name. 2. Will a degree get you that promotion or increase your earning potential in your current field? Is so, how and by when? 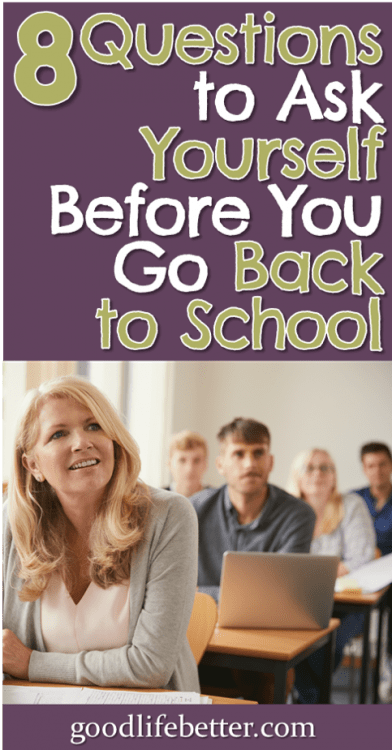 I love school and I love learning so the fact I am willing to be so crass as to ask what the ROI (return on investment) will be on your degree illustrates just how high the stakes are when it comes to the time and money involved in going back to school. Don’t just assume it will help. Do the research and figure out exactly when it will pay off. 3. If you want to transition to a different field, how will getting a degree help? When will you be able to make the switch? 4. Is it possible to achieve what you want without getting this degree? Answering this question may require not just researching the position you want to move into but also doing a bit of soul-searching. If you are continually getting passed over for a promotion, the reason could be you lack a credential. 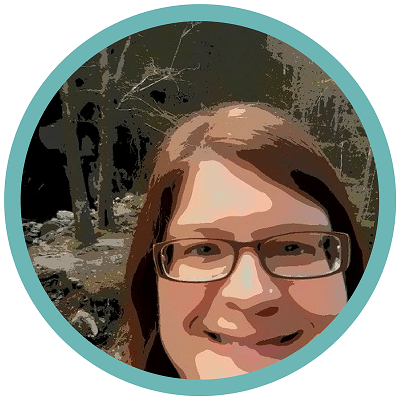 But it could also be you have burned some bridges over the years, or you don’t come across as someone who can successfully manage a team (check out this post about my experience getting passed over for a promotion). A degree isn’t going to address those issues. 5. What schools offer this degree? Is the school/program reputable? If you are going to attend a bricks and mortar school, will the classes fit into your schedule? What will the commute be like? For both in-person and online programs, does the school have a good reputation? I know this last question makes me sound like a snob but the truth is not all institutions are equal when it comes to preparing their students. If the reason you are getting a degree is to advance your career then the reputation of the school matters. Unsure how an institution is perceived in your field? Ask around. 6. How will you ensure you get the work done? It would be awesome if getting an ‘A’ required only a brand new notebook and fun pens with which to take notes. Unfortunately, being successful will likely mean a lot of hours reading, researching and writing papers, preparing for exams, group projects (shudder), and more. Will you be able to motivate yourself to get the work done? If not, think really hard before spending money on tuition. 7. How will you pay for this degree? If you need to borrow money, what is your repayment strategy? Will your current (or a future) employer foot the bill for you going back to school or taking classes? If not, can you cash flow your tuition (what I wish I had done for law school)? If you have no choice but to borrow money, what is your repayment strategy? I didn’t get serious about paying my student loans off until I had been out of school almost six years. Now that I am gazelle-intense on getting rid of them, I could kick myself for not prioritizing it sooner. 8. How much time will it take on a weekly, monthly, and yearly basis? What opportunities will you forego because you are in school? Understandably, you won’t know before you start exactly how much time it will require but at least try to calculate the number of hours required each week. And, if you are struggling to find the time to complete the application process or prepare for the entrance exam, chances are attending classes will be a bigger burden. Now that you’ve started your program, and have a better understanding of what is required, there is no shame in asking yourself if you would do it all over again. I recently spoke with a friend of mine who got halfway through a masters degree before dropping out. It was a very expensive school and the company paying his way changed their tuition-reimbursement policies. Asked if he regretted it, he said he did not and I believed him. Finishing the program would have likely cost him tens of thousands of dollars and he didn’t need it to advance his career. Don’t be afraid to do these calculations too! What Factors Did You Weigh? Going back to school may be the best decision you ever make. But given the time and money involved you owe it to yourself and your family to think through what it will mean in the longer term. I am mostly glad I went to law school but I regret that I didn’t spend more time on the decision, especially the financial costs. Let me know in the comment section below what factors you considered in making your decision and if you ended up going back! I’ve been giving some thought to going back to school to get my master’s degree. My primary reason is that I don’t want to get pushed out of the job market when I am older. It seems that everyone is jumping on the MBA train (kind of feels like a cult now). I’m currently 26, and I’m worried that 25 years from now, when I am competing with either people my own age or younger generations with similar skills but who have an advantage because they got their master’s, I will lose out on some opportunities. I currently have no debt and no dependents (other than my dog, if you count that), so this feels like the right time to do it from a financial perspective (no mortgage, student loans, kids, etc.). I’m curious about what you think! This is such a great question! If you truly need an advanced degree to be competitive in your chosen field, then explore your options. I have two post-graduate degrees (a Masters in Public Administration and a JD), both of which I did part-time while working full time (it is a pain but doable, and given your situation could work out well). With my MPA, I was able to get my employer to help some and pay cash for the rest. For my JD, I took out loans for tuition only (although looking back, I wish I had tried harder to cash flow it too). Ask yourself, what is the cheapest, best program in my area that I can attend? I applied to one law school only because the only other part-time program near me was a for-profit school that was ranked really low. If I hadn’t gotten in to the one school, I just wouldn’t have gone to law school. Next, figure out the money. Will your employer help? Can I put money aside for the next two years and then cash flow it? I waited 5 years to go back for my MPA and an additional 3 years to start my JD. By waiting, I knew better what I wanted and why. Having the credential may end up being important but the work history is important too. In 25 years, whatever you learn in the next 3-4 probably won’t matter near as much as what you have learned working. Best of luck! Hello, thanks for sharing this info. I have considered going back to get my Masters. Glad you found it helpful—thank you for the comment!